New Wave Domesticity: secretary's day! so, i work for a really great company. we are a virtual receptionist company with about 35 women and one man. it's not a flashy job and at times it can drive me insane and wears me out, but they do their best to try to make the best of it and make it different than a call center and make i a really positive place to work which is really wonderful. i love my coworkers wholeheartedly and it's good to work in a place that i feel some love when i walk into it. 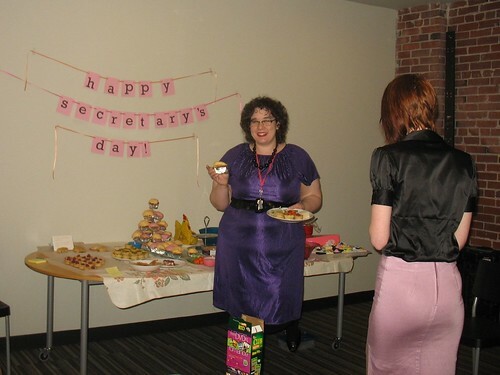 yesterday, april 22nd was secretary's day and since we work in an office full of secretaries, i helped organized a cute retro tea party potluck at work. it was completely adorable and eveyone in the office was sort of glowing with delight today. we asked people to dress up like old fashioned secrataries, rented a cute silver tea service, and decorated the conference room. i made this little banner and spent tuesday night baking cupcakes for hours and hours. 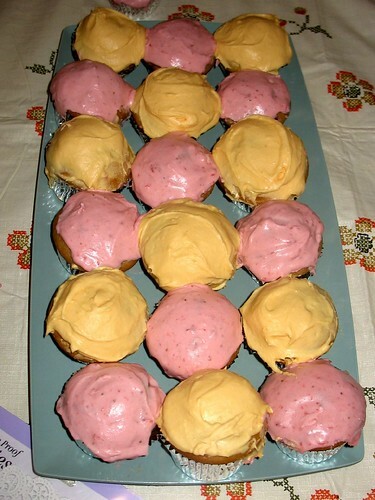 our work colors are orange and pink, so i made vegan mango cupcakes and vegan strawberry cupcakes. recipes coming next.